Open guitar tuning is a form of alternate tuning (from the standard E A D G B e) based around the notes of a major or minor chord. When you're in open E tuning, for example, if you strum across all 6 strings open (without fretting), you will hear the chord E major. The advantage of open tuning is you can use the fact it's already tuned to a chord as a base and your other fingers are freed up to build on that chord with interesting extensions. It's also used by bottle neck slide players, as you can apply the bottle neck across 5 or 6 strings to create that sliding chord effect. Open guitar tuning can get you some rich sounds and different colors than we're used to with standard tuning. It's by no means a replacement for standard tuning, but something to have fun experimenting with. Use the tuners below or try the flashier open guitar tuning tool here. Click each string to hear and tune up. Playing all 6 strings unfretted in open A tuning sounds an A major chord. Playing all 6 strings unfretted in open C tuning sounds a C major chord. Playing all 6 strings unfretted in open D tuning sounds a D major chord. Playing all 6 strings unfretted in open E tuning sounds an E major chord. Playing all 6 strings unfretted in open G tuning sounds a G major chord. Obviously, when you tune out of standard tuning (E A D G B e), any chord forms you knew in standard tuning will sound completely different. Open tuning allows you simply to barre your index finger across all 6 strings to create a "base" major or minor chord (depending on whether you're in open major or open minor tuning). 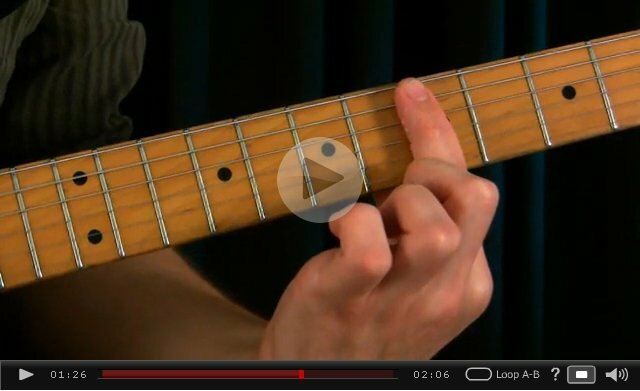 You can then use your other fingers to add notes to that base chord. The below open tuning chord table will show you what this base/barre chord will be at diffrent frets for different open tunings. Remember, the 12th fret is the octave of the open strings, so we get the same notes at the 12th fret as the open strings.